The lack of ethnic diversity in the geosciences is obvious at almost any geoscience conference, but the actual numbers of minorities in the geosciences  less than 5 percent of the Ph.D.s  brings the observation starkly home. Such a low representation creates a problem for the geosciences because our profession lacks input and contributions from this growing community. Although the problem is evident, the reasons for low minority participation are not so clear. One way we can approach the issue is to identify what attracts a student to the geosciences in the first place, to see if we can make the entry route at the undergraduate level more inviting to minorities. Many undergrads enter the geosciences almost by accident: They simply need a course to fulfill a science requirement. Once inside the earth science department, however, they find the material exciting and the welcoming atmosphere much to their liking. Other students are attracted because they like to spend time outdoors: They are the typical rock climbers, campers and hikers. Often a combination of these factors draws young people into the field. A student in Hartford, Conn., connects with her local watershed as part of hands-on program to enhance minority participation in the geosciences. Photo courtesy of Suzanne OConnell. These potential entry paths do not serve minority students well. One reason is the fact that many of them have no opportunities to study earth science during their undergraduate years. Most historically black colleges, for example, which serve as an important conduit for minority professionals, do not offer any geoscience courses. In the University of Puerto Rico system, only the Mayaguez campus offers a geology degree. The second traditional pipeline  love of the outdoors  also does not apply to many Hispanic- and African-American students, who come from primarily urban environments, with little exposure to fields, wetlands and waterways. In Hartford, Conn., we decided to address the latter issue by designing a two-year program for local high school students that introduces them to their other neighborhood, the Connecticut River watershed. Through a series of outdoor excursions and activities, these students gain exposure to earth science as a problem-solving discipline in a challenging and supportive atmosphere that focuses on watersheds and water quality. Deirdre Brickhouse of Hartford, Conn., and Sarah Basiaga of Rocky Hill, Conn., sit by the side of the Hockanum River in East Hartford, just upstream from its confluence with the Connecticut River. They are preparing to test water samples for dissolved oxygen. Where do the fish live? Can we eat the fish? Is it safe to swim in the water? Through the Connecting With the River program, one of our goals was to enable the students to answer their most basic questions. We took samples from the Connecticut River, its two Hartford area tributaries (the Hockanum and Park rivers), and coves and ponds adjacent to or feeding into these rivers. We plotted sample locations on U.S. Geological Survey topographic maps. 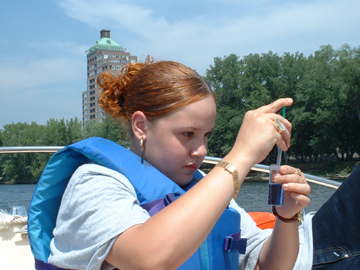 Water-quality data was collected using chemical techniques (titration and colorimetric analysis with Hach and Lamotte kits) and Vernier probes interfaced to TI-83 calculators. Funded by the National Science Foundation, Connecting with the River, initially targeted students attending the Greater Hartford Academy of Math and Science (GHAMAS), a magnet high school. GHAMAS, in its second year of operation in the academic year 2001-2002, is a relatively small high school with a combined enrollment of approximately 120 students in the 9th and 10th grades. Students attend the school for half a day, taking only math and science classes; other courses are taken at their home high schools. Half of the students live in Hartford and the other half come from 11 other participating towns, primarily suburban. Participating school districts are also eligible for outreach programs coordinated through GHAMAS. The advantage of working with GHAMAS students is that they or their parents have already expressed an interest in science and math and have more extensive backgrounds in these fields. The program originally planned for two groups of about 15 students to participate in a two-week summer program in 2002, continue with meetings and field trips during the academic year, and complete their activities this summer. We initially planned to recruit students who would be entering the 10th grade because they would already have had a year of high school earth science. Because these students were also too young to qualify for part-time salaried employment, they would likely be more receptive to an unpaid academic summer program. Our first obstacle was student recruitment. Despite attending all six 9th- and 10th-grade classes and parent meetings to describe the program, despite sending program brochures to science teachers and guidance counselors in participating school districts and to families at these schools who had previously shown interest in enrichment programs, and despite expanding the applicant range to students in grades 8 through 11, we received just nine applications (five from GHAMAS, three from non-Hartford public schools and one from a Hartford Catholic school). Eight young people enrolled in summer 2002 and seven completed the first two-week program. Four were minorities; the three non-minority students were female. While developing the program, we had forged a relationship with Riverfront Recapture, an urban revitalization organization with a focus on the Connecticut River. They had organized summer programs for students in previous years. Through them, we met with administrators from the Hartford public schools and were able to organize a second Connecting With the River program at Bulkeley High School in southeast Hartford for students who came from a wide variety of academic backgrounds. Students received one high school science credit from the state of Connecticut and a stipend of $20 per day. This second program ran for six weeks (the longer session was necessary to receive the science credit). During the first four weeks, the program was based at Bulkeley High School and was organized by their science faculty, with guidance from us. For the last two weeks, the Bulkeley students attended GHAMAS, where we taught the classes in conjunction with the high school teachers. Sixteen students who were entering grades 10 through 12 participated. Fourteen were ethnic minorities, and the two non-minority participants were females. Fourteen students completed the program. Although the students had not yet taken chemistry, we gave them the scientific basis for understanding the testing procedures. We used the Water Quality Index (WQI) to determine which measurements to make. This index, developed in 1970 through the National Sanitation Foundation, is based on measurements of temperature, pH, dissolved oxygen, nitrate, phosphate, turbidity, coliform and biological oxygen demand. The values are scaled and different weights are given to various measurements depending on their importance; for example, dissolved oxygen receives more weight than turbidity. This constitutes the WQI, a number with no unit, ranging from 1 to 100. Higher numbers indicate better water quality. We only measured the first five parameters and rescaled the values to generate our own WQI. Prior to going into the field, students learned the importance of each type of measurement and practiced measuring techniques. The laboratory work was particularly important because most of the students had spent very little time outside and were not comfortable being outdoors. One student, for example, was terrified of a butterfly that landed on him. Students compiled collected data into a spreadsheet. At the end of the first week, we divided the students into small groups of one to three; each group selected one of the water-quality parameters to focus upon. We challenged them to become experts, to learn more about the measurement process, interpret the data and prepare to present their findings. During the second week, we continued to collect samples and visit new sampling locations. Our activities included a boat trip on the Connecticut River. The last afternoon was devoted to a formal presentation of student results, followed by a reception. We invited parents, though few attended, and each student received a certificate and a copy of The River Book by James G. MacBroom. A detailed assessment of the programs first-year activities is under review for the Journal of Geoscience Education, but our initial evaluation indicates it was a success. We were particularly encouraged by the responses from the students, who told us that they had developed a greater appreciation for science, the rivers around Hartford, and the issue of pollution and how it impacts them. The majority of the students also indicated that the program would help them in subsequent science classes and that they would like to continue. All would recommend the program to another student interested in science. Five field trips during the 2002-2003 academic year helped the students stay in touch with each other and strengthened the connections that had been forged during the previous summer. They toured the Boston Museum of Science and watched an IMAX movie; visited the Norwalk Maritime Center, where they visited Long Island Sound to sample four different marine environments; took a coastal environment walk along the mouth of the Connecticut River; visited an aquarium; and spent an evening at Wesleyan University that included dinner in the student cafeteria and a presentation about astronomy and star gazing. About eight students attended each trip. From the original two groups, nine students took part in the second summer program, which ended just weeks ago. This summers focus was twofold: increasing the sophistication of data collection and analysis, and teaching the continuing participants how to mentor the middle-school students just entering the program. Joining the program were approximately 80 students entering the 7th and 8th grades at the Two Rivers Middle Magnet School in East Hartford, located at the confluence of the Hockanum and Connecticut rivers. During the first week, the high school students reviewed measurement parameters and learned new techniques for some of the parameters because we no longer had access to the Vernier probes and TI-83 calculators. Over a two-day period, the high-school students showed the middle-school students how to take each measurement. They established an immediate rapport with the younger students and found their own confidence and authority growing in their new teaching roles. In the second week, all the participants went out on the Connecticut River in boats to collect samples and perform WQI analyses. The high school students also gathered samples from the mouth of the Connecticut River and observed river flow and salt wedge dynamics. The program ended with another tour of Wesleyan University  this time to learn about the college application process, check out financial aid, and explore the world of opportunities that await them if they choose earth science for a career. The populations of Riverside and San Bernardino counties in Southern California are among the fastest-growing in the United States. Supporting both a diverse mix of ethnicities and a unique geological setting, the region is an ideal place to reach out to underrepresented minority groups and show them what geology is all about. For the past two years, Sally McGill, a geology professor, and her colleagues at Cal State, San Bernardino (CSUSB), have been doing just that. Working with a three-year grant from the National Science Foundation (NSF), they have been involving minority students from middle school through graduate school in hands-on research and activities focused on understanding the regions geology. At almost all the schools around Cal State, San Bernardino, the majority of students are from underrepresented groups  Hispanic and some African American, McGill says. So, when she and other professors visit local schools to engage students in geology to talk about related careers, they know they are reaching kids who dont usually think about geology as a potential life path. Nationwide, only a handful of minority students choose to major in the geosciences once they get to college (see Geotimes, this issue; see story online later this month). Local school visits are just one part of an outreach program designed to attract students to geology at all educational levels. Sometimes the students come directly to campus, where they can take a hike to the San Andreas fault, just three-quarters of a mile away. Its a nice feature we can show them, and they can say theyre standing on part of the plate boundary, McGill says. CSUSB also conducts week-long summer geology workshops for local middle and high school teachers. Students from Etiwanda High School on a field trip to Pisgah crater in Southern California in June 2002. The trip is part of a three-year grant at Cal State, San Bernardino, to involve minority students from middle school through graduate school in hands-on research and activities to understand the regions geology. Courtesy of Sally McGill. But, the grant project is not just for young students; a key component of the program involves undergraduate students in scientific research. We try to get them interested in geology and once theyre interested, we try to hook them and keep them interested by giving them an experience where they can feel theyre actually doing something worthwhile and contributing to the growth of knowledge in the field, McGill says. The main research project uses GPS (global positioning system) to monitor the bending of the tectonic plates near the CSUSB campus, which is also close to the San Jacinto fault. Weve picked a line of benchmarks that have been surveyed previously, and were occupying those every six months with GPS receivers and then seeing how fast the plates are moving and how fast the strain is accumulating on the two faults, McGill says. Working with the Southern California Earthquake Center, McGill, Joan Fryxell (also at CSUSB) and their student team hope their data will add finer spatial resolution to the already large database of GPS data in Southern California. They plan to analyze the data and eventually publish it. This summer, the CSUSB program had 31 participants, including 10 teachers and 21 college students. Most of the students came from underrepresented minority groups. While its tough to measure the success of the program only two years in, McGill says that they have already seen several participating undergraduate students choose geology as their minor. The number of Hispanic students in the CSUSB geology department rose from two to seven from spring 2001 to spring 2002, with those students now comprising 25 percent of the department  more than eight times higher than the national average. While that might not be due to the NSF grant, its a good sign, McGill says. With the younger students, it could be up to six years before they see any results. A key to reaching minority students is creating role models, McGill says. She thinks, for example, that the large number of women geology majors at CSUSB may relate to the fact that half of the geology faculty is female. I suspect that something similar may happen with underrepresented ethnic minorities  that if they saw more people who look like them being geologists and being geology teachers, then that might give them the idea that this is something they can do, she says. For that reason, the project also tries to hire students from underrepresented groups to be outreach assistants for the middle school and high school programs. So that when I give talks at schools, theyre not just looking at a white woman talking about geology, McGill says. Now that the second year of the project is coming to a close, the CSUSB geology department is already looking to the future, hoping to collaborate with Jackie Hams, a geology professor, who is African-American and teaches at Los Angeles Valley College, a community college in Sherman Oaks, Calif. The GPS research would then expand into the San Fernando Valley. Eventually, McGill adds, NSF would like to see all its grants become mere seeds of a long-term, self-sustaining commitment to minority representation in the geosciences. OConnell is an associate professor in the Department of Earth and Environmental Sciences at Wesleyan University, Middletown, Conn. E-mail: soconnell@wesleyan.edu. Ortiz is an assistant professor in the Department of Geology at Kent State University, Kent, Ohio. E-mail: jortiz@kent.edu. Morrison is a visiting professor in the Department of Chemistry at Trinity College, Hartford, Conn. E-mail: janet.morrison@trincoll.edu. Holmes, M.A., Frey, C., O'Connell, S. (in press), "What Makes a Geoscience Major? What Makes a Geoscientist? Results from Focus Groups of Geoscientists," 2003 GSA abstracts with programs.